The group also revealed plans to develop another five-star property in the kingdom. Estimated to cost over BD7 million ($18 million), the Juffair Views will be a luxurious hotel apartment development featuring 120 suites, a restaurant, spa, health club and outdoor swimming pool. Raj Shetty, chairman of Ramee Group of Hotels and Ramee Properties, said: "This acquisition will add value to the property and give us an opportunity to provide enhanced services." "Bahrain's hospitality sector showed positive results last year, as our occupancy rates went up 4-5 per cent compared to 2015," he said. "We have been continously investing in the kingdom for the past 20 years and will continue to do so. we have great confidence in our team here and their approach. we are produ of the kingdom's leadership and theri vision in providing the necessary infrastructure for the hospitality industry to grow. We would like to take this opportunity to thank the Ministry of Industry, Commerce and Tourism for their continuous support," said Shetty. Also present at the conference were Girish Rodiyal, executive assistant manager of Ramee Grand Hotel, Seef; Ahamed Nadeem, project head, Ramee Group; and Brian Spence, Group general manager. Located in close proximity to shopping destinations, the exhibition centre and conveniently accessible from King Fahd Causeway, Ramee Grand Hotel and Spa offers 175 rooms, a variety of dining options, a rejuvenating Spa, health club, salon and swimming pool. Speaking on the Juffair Views, Nadeem said construction is expected to begin in 2018 and it will be fully operational by the end of 2020. 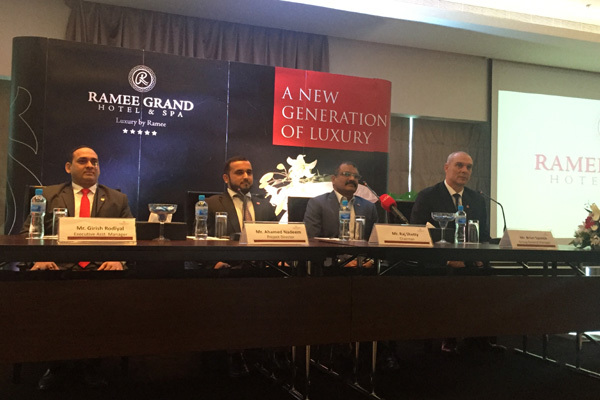 The group, which owns more than 40 properties in the region and India, has also been very aggressive in its expansion, unveiling plans to open a Ramee Grand Hotel and Spa in Dubai's Business Bay. Expected to cost Dh350 million ($95.2 million), construction of the hotel is already under way and it will be open to guests in 2019. The Dubai property will cover an area of 500,000-sq-ft and will offer 200 rooms, five food and beverage outlets, a 2,000-sq-m banquet hall as well as a spa and other amenities. "Ramee Grand Hotel and Spa is our flagship five-star brand and we are proud to take it to Dubai," Nadeem added. The Dubai hotel will be completely owned by the Ramee Group. Other expansion plans include Oman, where it is looking to add another 80 rooms and other F&B options to its exiting portfolio of three hotels.